Progress report on Pi Shawl blanket: Comfort Pi-a-la-mode. Needles: KnitPro Symfonie interchangeable circular needles, 5mm. The blanket has been making good progress. Knitting on circular needles is far slower, for me, than on straights – and I do find this frustrating. The added requirement of care and vigilance against breaking the fragile yarn also slows matters down. The stitches do not slide easily round the cable and I have to keep stopping to de-bunch them (about three times per round, actually.) It all takes time, but the blanket grows steadily nonetheless – just not as quickly as I had hoped and expected. All the same, it has already become quite unwieldy and is rapidly becoming a knit-on-the-bed-for-support kind of project. I have pretty much got the hang of knitting without breakages, though I must have rejoined my yarn perhaps 8 or 9 times by now. The yarn is certainly fragile, but it is also readily felted and a quick spit join makes barely a hiccup in progress. Currently on Round 30 of 96 in the 576 stitch section – it’s a long way between the excitements of increase rounds now and the 1152 stitch section is not even remotely in sight yet. I’m just going round in knitted circles, throwing in a ring of yarnovers every sixth round. Not yet bored, but beginning to feel a need for a change of knitting pace. I’m thinking that I won’t chase this blanket to an early finish but allow it to come naturally – and perhaps return to a little WIP-bashing activity. It is time to consider inserting a little lace section. I am seeking the right pattern and I don’t think that it can be found in my one stitch dictionary. I may have to buy a specifically lace-oriented stitch dictionary. 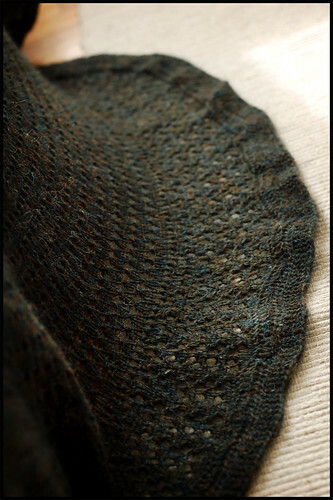 I’m going to place a lace border just before a knitted-on garter stitch edging, in much the same way as Brooklyn Tweed did. I really do not want to duplicate the same lace pattern. I want this blanket to have something of “me” in it. If you have any nice border suggestions, I’d be glad to hear of them. Yarn requirements are a worry; I’m halfway through my third plate of yarn, have already revised my size plans once, and am still only 33% complete on my knitting plan. I must either resize my ambition a second time, or send for more yarn. At the moment I am inclined to return to my original size plan and purchase more yarn to support that. I have a large bed – 5 feet wide, and a niggardly blanket would be inappropriate. Because of the generous bulk buy discounts, I am inclined to buy 6 more plates (20% discount), or even 12 (30% discount). At the moment I find it appealing to buy 3 more in this shade and 3 each of 3 different shades; the excess yarn to be directed at some felting projects – hats, perhaps. I’ve long wanted to try felted bowl-making too. I just need to find out if Nordic Store will apply the discount to mixed shades, or just to single shade purchases.